Taf 25% comes as an oral antibiotic containing Thiamphenicol which has broad-spectrum activity and thus can be used to treat a wide range of conditions. It is very powerful but non-toxic, highly cost-effective, and has a rapid effect against both gram-positive and negative organisms. 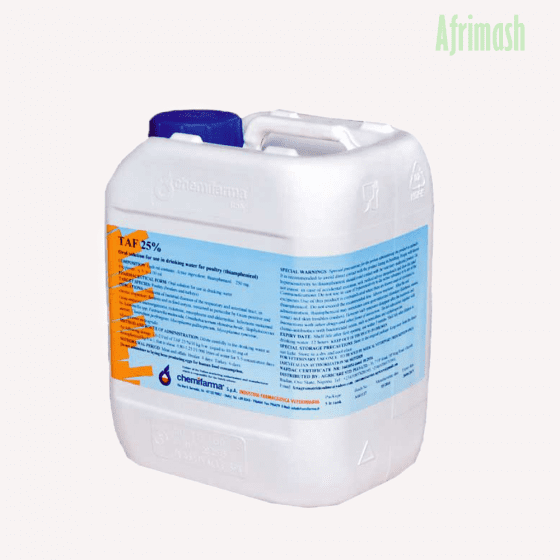 Taf 25% contains Thiamphenicol which is an antimicrobial formulation intended for the treatment of infectious diseases in cattle, pigs, and poultry. It is the methyl-sulfonyl analog of chloramphenicol and has a similar spectrum of activity, but is 2.5 to 5 times as potent. Its main advantage over chloramphenicol is that it has never been associated with aplastic anemia. Taf 25% has some additional advantages such as the broad-based spectrum of activity, non-toxicity with cost-effectiveness when compared with other products.